Sweet, smoky, salty, spicy… all in a little bite of the ocean! 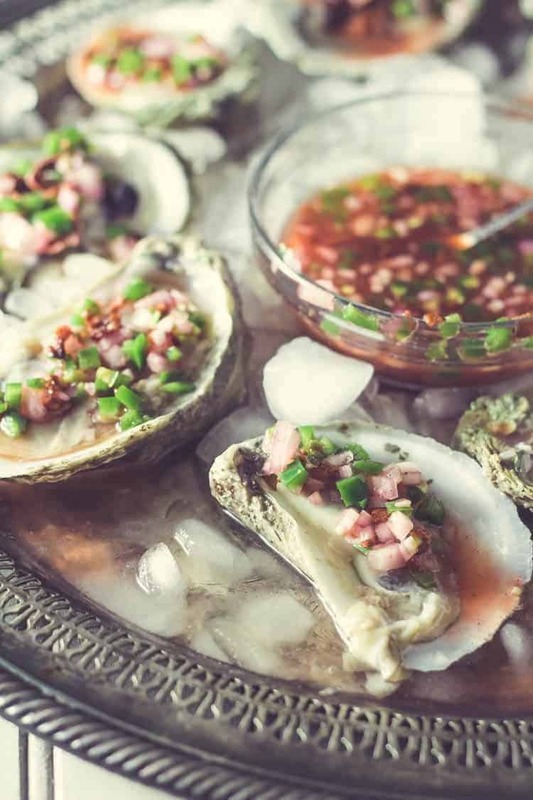 Oysters With Bacon, Blood Orange, and Jalapeño Mignonette is a simple and elegant starter course for adventurous foodies. Mignonette sauce is a sauce made with vinegar, finely minced shallots, and cracked pepper. Originally, mignonette referred to a cheesecloth sachet of peppercorns, cloves, and herbs, and it was used to flavor liquids. You may find a variety of other ingredients in the sauce, but it will contain (good quality) vinegar, finely minced shallots, and cracked pepper. 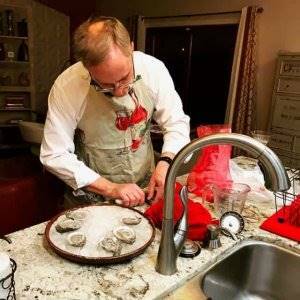 My husband shucks the oysters, while I make the mignonette sauce. I found a perfect tool on Amazon – a Zyliss Oyster Tool and Knife Set. Last year during oyster season, we had to open oysters with a flat head screw driver. Injuries ensued. In 10 minutes, the oysters and the mignonette sauce are nestled in their bed of ice. You know what they say about oysters right? 😀 These little beauties disappeared in an instant! We LOVED this dish paired with a Lemon Cucumber Basil Martini (future post). The lemon complemented the oysters and citrus notes. 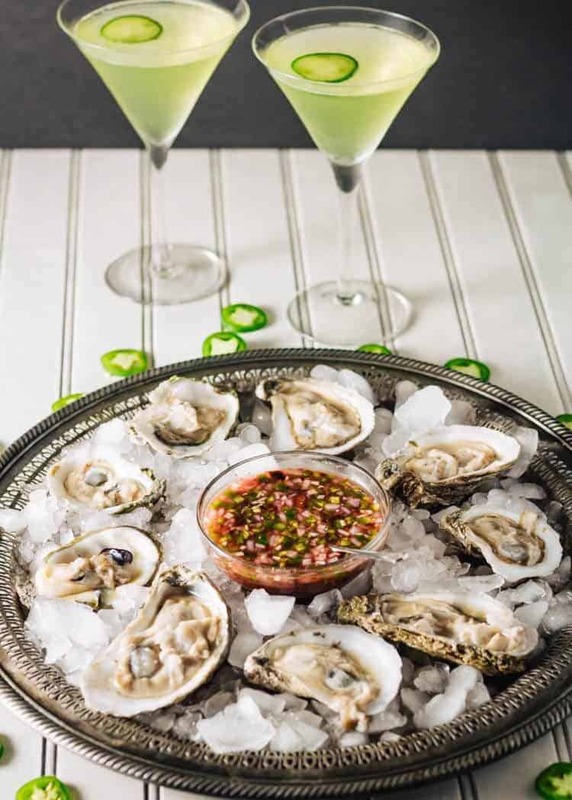 The oysters and mignonette sauce would also pair well with a crisp sauvignon blanc, or for craft beer lovers, a Saison. I have recently (with fear and trepidation) decided I need to do more (and better) videos. 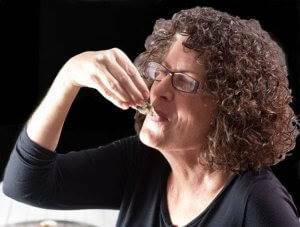 If you will leave a comment on this post expressing interest in an oyster shucking and/or mignonette sauce video, I promise to provide one! Would you like to see more or fewer recipes featuring these types of ingredients? Shuck the oysters. If you have a helper, one of you can do the shucking while the other whips up the mignonette. Whisk all the sauce ingredients together. Taste for seasoning. 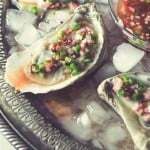 To serve, spoon the mignonette sauce over each oyster, tilt them up, and slide them down! Jalapeños vary widely in heat level. I made this dish on 2 successive nights with chiles purchased at the same time. One night my hands were fine, the next my hands, eyes, and lips burned. I used 1 small chile each night. I would suggest starting with half, and tasting. I love Trader Joe's Orange Muscat Champagne Vinegar! If you can't get it, a good quality vinegar like a champagne or citrus vinegar will be fine. Only use tightly closed shellfish! Macronutrients (approximation from MyFitnessPal): 142 calories; 9 g protein; 2 g fat; 14 g carbohydrates. I am such a rookie when it comes to oysters! But, this recipe definitely catches my eye with those beautiful zinger ingredients of bacon, blood orange, and jalapeno. YUM. Might have to reshare this one with my oyster-loving friends. 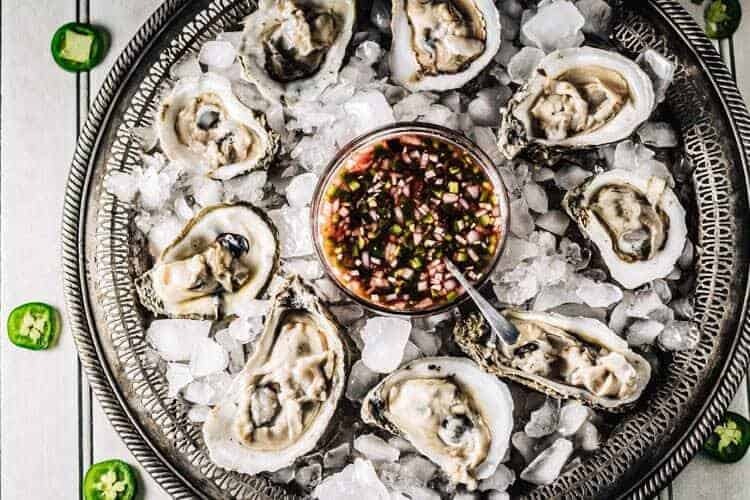 Oysters are a bit of an acquired taste :-) The mignonette, though, is pretty incredible, and oyster lovers are sure to enjoy the combination! Thanks for stopping by Cindy! Yes. Yes you did. Your Dad wouldn't agree to shuck oysters because of that... until I got the nifty tool set!